Already have a Learning Management System (LMS) and need an easy to use authoring tool? Choose the Design-a-Course Author! 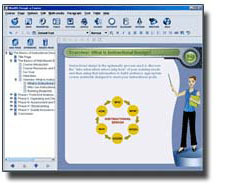 It is the same great course creation tool that is part of the Design-a-Course e-Learning System.With the Design-a-Course Author you can quickly and easily develop courseware that can be exported to your SCORM 1.2 or SCORM 2004 compliant LMS. $2400 per Design-a-Course Author License. Multi-license discounts available.